Distinguished Professor Kyungjae Myung of Life Sciences from the IBS Center of Genome Integrity at UNIST. 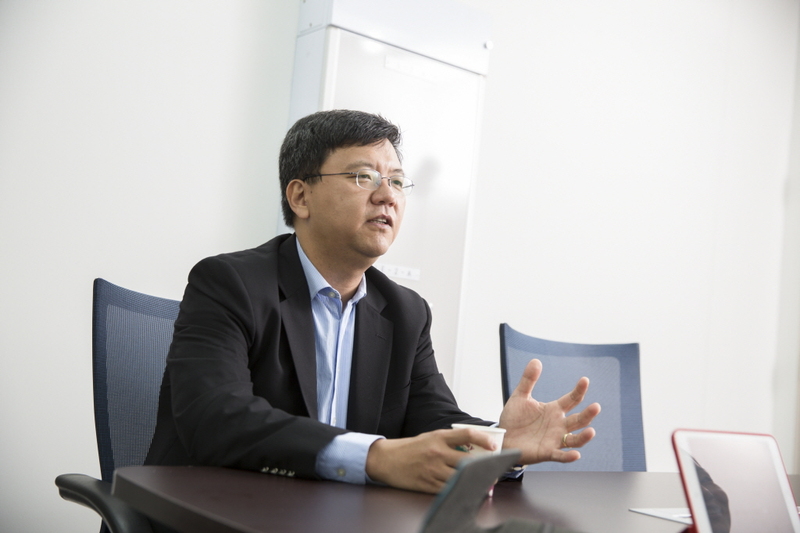 Distinguished Professor Kyungjae Myung's research team discovers an unexpected function of SHPRH. DNA repair proteins, in addition to their roles in DNA damage response and repair, have been found to contribute to the reduction of protein production by restricting the ribosomal DNA (rRNA) transcription. This discovery could lead to the development of new medicines to slow the effects of ageing or even halt the progression of cancer. A recent study, led by Distinguished Professor Kyungjae Myung’s team from the Center for Genomic Integrity, within the Institute for Basic Science (IBS) at UNIST, has revealed an unexpected role of a protein, involved in the DNA repair mechanism. The findings, published in the April issue of the Proceedings of the National Academy of Sciences (PNAS), report that the protein SHPRH (SNF2 histone linker PHD RING helicase) not only helps to fix mistakes generated during DNA replication, but also contributes to the generation of new ribosomes, the cell’s “protein factories.” The research team notes that this new task depends on the nutritional state of the cell and might be associated with aging and anemia. This study provides evidence that SHPRH functions in rRNA transcription through its interaction with histone H3 in a mammalian target of rapamycin (mTOR)-dependent manner. Above figure shows the localization of the SHPRH protein inside cellular nucleus. SHPRH (green) is localized inside the nucleus (blue), in particular in areas called nucleoli (red). The nucleoli are also the locations where ribosomes (the cell’s protein factories) are synthetized. SHPRH clusters (or foci) appear when cells starve. The research team found out that this extra function of SHPRH came from its location within the mammalian cells. They discovered that SHPRH is located inside the cell’s nucleus, in particular sections of the nucleus where ribosomes are made, known as nucleoli. Interestingly, when no new nutrients were added to the cells for multiple days, clusters of SHPRH appeared. This triggered the idea to test SHPRH behavior during cellular starvation. As expected, the research team found that just two hours after growing cells without nutrients in the experiment, SHPRH clusters (or foci) appeared, and when nutrients were added, they disappeared again. 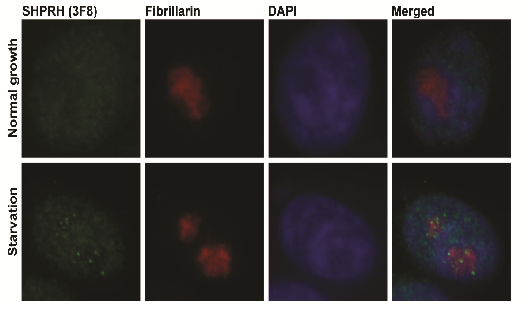 Since nucleoli are the production sites of ribosomes, the research team investigated SHPRH’s role in ribosome synthesis and clarified that the second function of SHPRH in mammals is associated with the transcription of rRNA, an essential component of ribosomes. Above figure shows the regulation of rRNA transcription via the formation of SHPRH nuclear assembly. DNA repair proteins are often connected with the growth function. For instance, the rate of cell proliferation depends on the rate of protein synthesis, which is regulated by the ribosome and the rRNA. When cells lack nutrition, they slow their energy consumption and reduce ribosome production via rDNA transcription. The reason for doing this is to slow the effects of aging and to delay the onset and progression of cancer. Moreover, since flaws in ribosome biogenesis are connected with several metabolic problems, such as aging, anemia and cancer, studying these proteins is worthwhile, according to the research team. In case of cellular starvation, SHPRH is clustered in foci and dissociated from ribosomal DNA that is packed in a so-called ‘poised’ state, ready to be active as soon as the cell has enough nutrients. 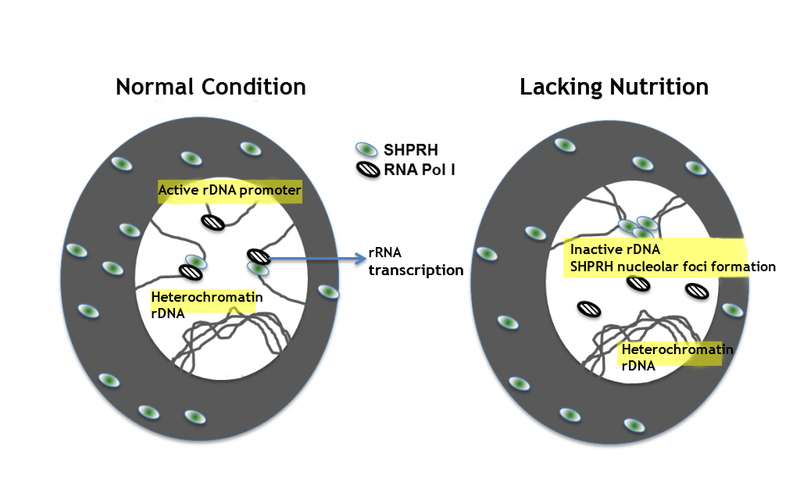 For this reason, if nutrients are added during a time of starvation, the SHPRH spots disappear and ribosome production can be quickly recovered. This study has been supported by the intramural Research Programs of the National Human Genome Research Institute and of the National Institute of Child health and Human Development. Deokjae Lee, Jungeun An, Young-Un Park, Hungjiun Liaw, Roger Woodgate, Jun Hong Park, and Kyungjae Myung. “SHPRH regulates rRNA transcription by recognizing the histone code in an mTOR-dependent manner,” PNAS (2017).